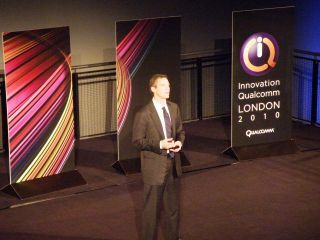 Qualcomm has announced that its new 1.5GHz Snapdragon processors will be in devices by early 2011. Speaking at Qualcomm's 2010 innovation exhibition, CEO and Chairman of Qualcomm Dr Paul Jacobs confirmed that both dual-core and 1.5GHz processors would be landing in the near future. When asked when the faster chips would actually be landing in devices, Jacobs confirmed it would happen 'in the early part of 2011'. Given that a number of phones are released at the end of Q1/the beginning of Q2, we should start seeing ultra-fast, low power devices in the near future. One manufacturer that isn't likely to be part of the launch is LG, which recently announced it will be using Nvidia's Tegra 2 chips in its smartphones as it looks to the next generation of mobile handsets. Qualcomm also confirmed that the first LTE phones, bringing faster speeds and higher bandwidth, powered by its 4G chips will be coming next year, with some 'data devices' appearing in 2010.